Home Knife Collecting Is The Scandi The Best Grind For Bushcraft Knives? Editor’s Note: This article is by both Abe Elias (arguing for the Scandi) and James Morgan Ayres (taking the opposite view). It is excerpted from the April 2019 issue of BLADE. What Is A Scandi Grind? A Scandi grind carries a single bevel that runs to zero degrees. In other words, it is a single grind only. Unlike many other grinds, the Scandi runs to the edge with no angle change in what is also known as a zero grind. Scandi grinds have a flat section of the blade that starts at the top of the bevel and runs to the spine. Anything else is simply not a Scandi. People have tried to create a variety of variations with names like modified Scandi or Scandi vex. In actuality, there are no variations of the Scandi because such “variations” usually are other grinds that already exist. Perfect wood geometry: The Scandi excels at bushcraft chores because its geometry is perfect for working with wood. Zero grind: The fact the Scandi is ground to zero allows the edge to be as thin as possible with no change in angle. Changes in angle create extra friction. Hence, the Scandi grind meets with the least resistance possible when it enters the cutting medium. Inertia is your friend: Another benefit of a Scandi grind is that you can achieve a thin edge and, unlike with a full flat grind, you maintain the blade weight of a saber grind. Having that bit of extra spine weight increases your ability to drive the edge forward. Parting is such sweet sorrow: As the blade enters the cutting medium, it meets the transition point where the bevel changes to the flat. This benefit is one of the reasons why the knife can dive deep into a cut and take off huge potato-chip-like shavings. Geometry: The intersecting planes of the Scandi grind create a wedge. A wedge is useful for shallow woodcraft on soft woods, such as making fuzz sticks or carving spoons, and for batoning soft woods. However, the wedge creates too much resistance and drags and hangs up in deep cuts, especially in hard woods. Not ideal for food prep: That wedge also struggles with any dense or tough material, including root vegetables, which crack rather than split, and, importantly, on meat. Try butchering any large game with a Scandi grind and you’ll quickly learn why butchers and hunting guides do not use Scandi-ground blades. Goodbye, steel: The Scandi grind is also said to be easier to sharpen because the blade provides a guide. But, if the user follows the instructions of the advocates of Scandi, he must remove a great deal of steel, which requires hundreds of strokes on the stone. With a modicum of skill other grinds are faster and easier to sharpen. There is a better alternative: The smooth, slim, oval profile of the convex grind offers less resistance to materials, is superior to the Scandi on all points and will do everything better. If your bushcraft knife needs are limited to working with wood, you’ll find a Scandi grind will help you work fast and effectively. For tasks beyond that, you’ll likely find a convex grind is the better match. What About The Best Knife Books? 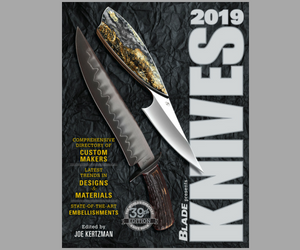 The best books about knives are at BLADE‘s official online store, ShopBlade.com.